Hi, Daniel. Looking at your Ableton screenshots I’ve noticed that you colorize all channels exactly the same way, with kick being red, bassline being orange, and so on. Does it have a meaning? How do you organize projects? Well spotted, Ewan! Yes, I use color labels for all channels in my projects indeed, it saves time and helps a lot. But not only that. Taking this opportunity, I would like to share my 3 tips for organizing projects, files, and folders. My very first Ableton project had absolutely random colors, channels positions, and no text labels at all. It was such a mess! Although there were just about 20-30 channels in total, so it was kinda okay. On a contrast, my current projects usually have around 90-120 channels, so I would spend nearly half of my studio time scrolling and looking for a right channel if I’d keep being such irresponsible to this chaos. So I’ve set myself a rule: whether I create a new Audio or MIDI channel, I always add color and text labels first before putting any plugins or devices, and same applies to Audio and MIDI clips. These colors don’t have any hidden meaning in it, although someone may find a similarity with chakras where red is also the base color and violet is on top :-) The point is I always know where is my bass, lead, and even “that peeeeow sound”. No more wasting time of scroll through the project window! Going further on the previous point, I also suggest naming your channels properly. Imagine if you would open this project one year later, having a hundred of channels named like “New Audio Copy 2” is certainly not the best way. Quite often I see funny pictures in social media and blogs about music producers who name their project files like “New1”, “FinalFinal” etc. I always thought it’s just a geek’s humor, but after speaking to fellow producers, it turned out that this problem is real: some people really struggles to find their own project files because of this! I never had this issue because, intuitively, I’ve made myself a system keeps things clear. So, basically, I have two folders on my disk called “Drafts” and “Finished”. When I create a new project, I save it in the “Drafts” folder and name it by the current date, e. g. “2016.08.24 Project”. This helps me to see when I started this project to make sure I don’t work on this for too long. If during production I do some significant change, I save it as another version with the incremental numbers, like v2, v3, v4 etc. So usually each project folder has several files (versions) in it. Once the project is done, I rename it to the final track name and move to the “Finished” folder, which groups tracks by release title — albums and EPs. These manipulations are so simple, yet makes all projects easily accessible. At any time, I know exactly where to find a project folder of “Enuma Elish” or “that track which I started a month ago”. We used to think that everything lasts forever, including our computers and disk drives. In reality, I often see how music producers get lost the results of their hard work for very various reasons: the DAW had crashed and not saved the last session, or the neighbor accidentally shut down power in your apartment, making your HDD died. To keep your projects and nerves safe, I highly recommend get yourself a cloud storage and put your entire project folder in there. Google Drive, Amazon, Dropbox, Apple, whatever. Personally, I use Dropbox. Every time I save the project, it gets instant and continuous backups, automatically. And if something goes wrong, I can download it back to another computer or even restore from a different version (Dropbox has “Version history”, not sure about other services). Another little tip is to use “File → Collect All and Save” function to make sure all of the samples used in this project are gathered in the project folder, and hence, get a backup in the cloud. This way you won’t open your project with a “missing audio” warning. 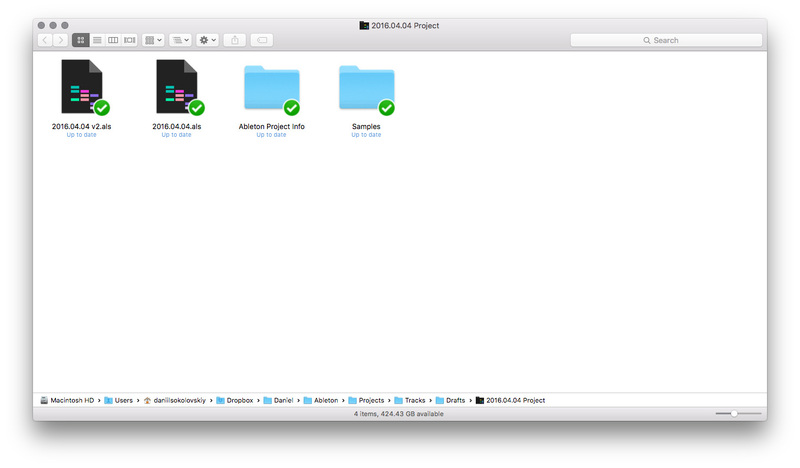 Make yourself a system to name project folders properly. Current date can work. Put your entire projects folder into Dropbox or Google Drive to get continuous backups. Still, do manual backups to external disk from time to time. This post is a part of the “Advice” series. I’m happy to advise on such topics as music production, sound design, performance, management, marketing, and career advice in the music industry and beyond. Send me your questions via this Google Form. Great advices, Daniel. Regarding project files’ naming what I do is I always have one file I’m working on with a file name ending with “progress” and each time I feel like I achieved something or need to back up the project at its current state, I save a duplicate of it to the same folder with a date appended and keep on working. When the project is done, it gets the name ending with “FINAL” and gets placed in the “Final” subdir. This way I always have only one file per project in the Recent files list and avoid confusion when working on multiple projects which happens often. Also when it comes to video editing, for example, as soon as you change the name of the file, new temporary and preview files and directories are created for it, which wastes disk space and clutters the project dir. So, you know. One master file and a bunch of copies with the final version safely tucked inside a subdir.